Spider-Man has a long history in video games—one that arguably has seen more lows than highs. Even in a world where superheroes are bigger than ever, Spider-Man is still waiting for a groundbreaking gaming experience like the Arkham series was for Batman. He might have finally got it in Marvel’s Spider-Man. Developed by Ratchet and Clank and Resistance’s Insomniac Games, and releasing exclusively for the Playstation 4 this week, Spider-Man has much in common with the aforementioned Arkham games. Both this and the first Arkham game, Asylum, represented bold attempts to finally do gaming justice to their respective comic book icons. And just as the Arkham games tasked you with playing as a new take on the long history of DC Comics’ Dark Knight—telling an original tale as you were let loose on an open world filled with criminals to fight and mysteries to solve—Spider-Man gives us a new take on Peter Parker and does much the same, in its own unique way. As a love letter to the myriad incarnations of the web-slinger across films, comics, TV, and yes, even other games, this slightly more mature iteration of Peter Parker offers Spider-Man a chance to deftly vault over retelling an origin story so well-known that it feels like pop culture knowledge imprinted on us at birth. But most crucial to its success is that it also allows the game to present a new take on a cast of familiar faces from Peter’s comic book social circles, presenting fascinating new dynamics between Peter and both his amazing friends and his superior foes. Propelling yourself around Manhattan is one of the highlights of Marvel’s Spider-Man. The over 20-odd hours I spent completing the story of Marvel’s Spider-Man (give or take a few extra hours spent aimlessly swinging around the game’s gorgeous recreation of Manhattan), getting to watch this new imagining of such an iconic hero unfold, and continually surprising me with twists on familiar relationships from one of the most enduring supporting casts in comics history, was a total delight. Beyond that, the game also absolutely nails the feeling of being an experienced Spider-Man unleashed on the playground of New York. It’s a playground packed with plenty of sidequests and activities and from combat-packed bases to clear out to car chases to foil, it ensures there’s never a dull moment as you make your way through the major story missions. While Spider-Man excels at honoring the nearly 60-year-legacy of Spidey and making you feel like him in the process of playing, its true secret weapon isn’t the suits or the superpowers: it’s the man behind them, Peter Parker. The game primarily evokes that exhilarating Spidey-sensation in its moment to moment through one of the biggest appeals of any Spider-Man game: the web swinging. Even at its most basic, the traversal of Spider-Man is elegant and rhythmic, as you find the sweet spot between leaping from one web and launching another to catapult yourself between the skyscrapers of New York. But when you start getting more used to it, and integrating other techniques —like the ability to zip line to (and then acrobatically propel yourself off of) a targeted point in your surroundings, such as the edge of a billboard or the top of a street lamp—getting around Manhattan becomes a giddy joy. 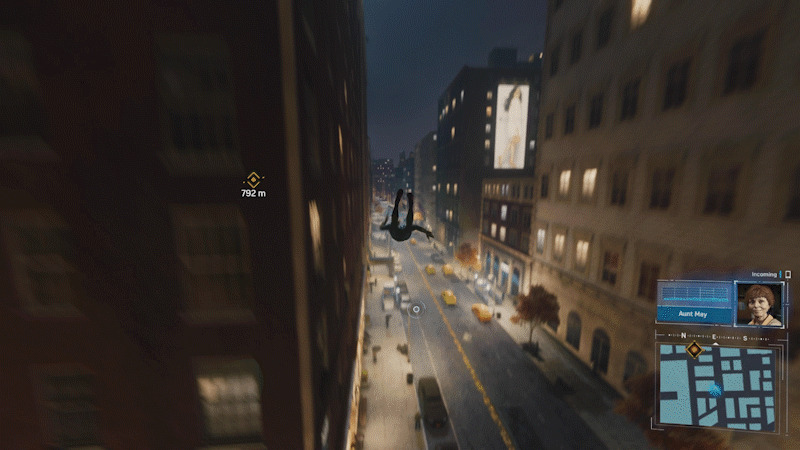 As you zip, swing, and leap over buildings, you make a game of keeping your momentum and flow as you dash around. Sure, eventually you unlock the ability to fast travel around the map—complete with cute little vignettes of Spidey, like every New Yorker, taking the subway to get somewhere—but why would you when swinging around feels like such a blast? On a basic level, combat in Marvel’s Spider-Man draws heavy inspiration from franchises like the Batman Arkham games, but it integrates acrobatic moves and unique gadgets to give it a strong spider-sense. This speed and acrobatic sensibility also apply to the combat. While on the surface level similar to the fisticuffs of the Arkham series, Spider-Man trades the weightiness and reliance on counter-attacks of that franchise’s tried-and-tested combat system for a manic feeling of ping-ponging between foes, dodging attack after attack while unleashing a speedy flurry of your own hits. As you level up and start filling up the three different skill trees—one focusing on Spider-gadgets like web bombs and even drones, one focusing on ground combat, and a third based around air combat and traversal—Peter’s toolset in fights become increasingly varied. And as your foes themselves start arriving in larger and more diverse numbers, it’s increasingly vital to your survival. The game constantly drives you to not just engage with all these systems, but to do so in ways that capture the feel of the Spider-Man that you’ve come to know in comics, movies, and TV shows: that sensation of zipping around with speed and grace at a mile a minute, using your wits as much as you are using your fists. Spider-Man marries this mechanical love letter to the acrobatic character with a deep appreciation for his legacy across decades of comics, movies, and TV. Sometimes this appreciation can show up in small story beats—like an action sequence uncannily similar to a moment from the Sam Raimi Spider-Man trilogy going awry, only for Peter to quip that his plan worked “last time.” Or another, where Spidey offers a gang of thugs the chance to settle their conflict over some fruit pies, a nod to his infamous days as a willing shill for Hostess baked goods. But that knowing love of Spider-Man’s past comes through the clearest in two of the game’s main collectibles. The Scarlet Spider costume is just one of many comics nods fans can unlock in the game. 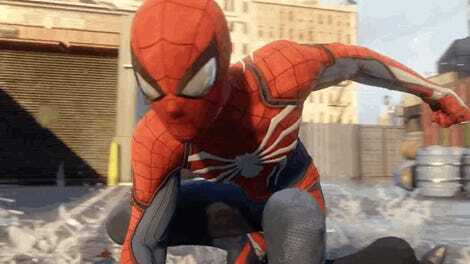 First and foremost of these is the swathe of unlockable suits—25-plus in all—that draw across everything from the recent Spider-Man movies to the most obscure corners of the Marvel Comics universe, letting you swing around video game New York as the original Scarlet Spider, or even in the Iron Spider suit from Avengers: Infinity War. These aren’t just shoutouts to dedicated followers of Spider-fashion, either. 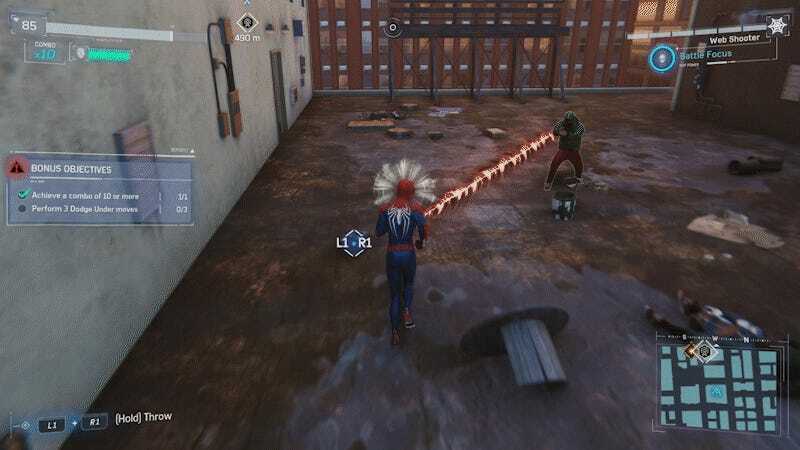 Each suit, unlocked by tokens earned from the various side-activities the game has to offer, also has a unique special ability that enhances Spider-Man’s vast arsenal—and can be transferred to any other suit, should you want a specific power but a different costume. The Scarlet Spider suit, for example, lets Peter project holographic “clones” of himself as a distraction, a useful tool that is also perhaps a cheeky nod to the Clone Saga comic storyline that gave us the Scarlet Spider in the first place. The second of these collectibles is actually one of the myriad sidequests the game has: old backpacks you can find that the younger Peter Parker left webbed around the city, each containing an artifact from his past. 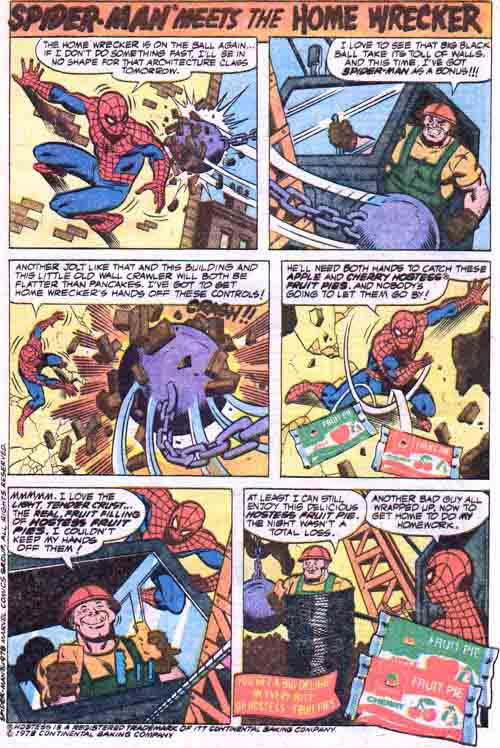 Some serve to flesh out the background history of this version of Spider-Man, filling in the gaps of his early career that the story itself doesn’t cover. Some offer gleefully knowing nods at the wider Marvel universe beyond Peter himself, like a business card from a certain blind lawyer. But others especially call out obscure moments from Peter’s comic history, making the discovery of every new backpack a sweet callback for fans, and a persistent reminder that Insomniac’s love for the character and his history is both earnest and ever-present throughout the game. Peter’s relationship with Martin Li is just one of several in the game that toes the line between friend and foe. While Spider-Man excels at honoring the nearly 60-year-legacy of Spidey and making you feel like him in the process of playing, its true secret weapon isn’t the suits or the superpowers: it’s the man behind them, Peter Parker. This might sound like a weird point to make—after all, Peter Parker and Spider-Man are one and the same. But while many games in Spidey’s decades-long history with the medium have chosen to primarily focus on the superheroic side, Spider-Man embraces the fact that Peter’s life outside his costume is just as vital to the story as the moments he’s acting as the friendly neighborhood Spider-Man. Anchored by a remarkable performance by Yuri Lowenthal in the title role, Spider-Man puts Peter—here a 23-year-old photographer-turned-scientist, who is eight years into his alternate life as Spider-Man—at the heart of everything going on in its story. It does so symbolically, in that he’s ever-present masked and unmasked, and literally, as you spend plenty of time actually playing sequences as Peter in his civilian life—whether it’s completing simple puzzles replicating his day job as a scientist, or walking around FEAST, the homeless shelter where Aunt May works, soaking in little details about this particular take on the Spider-Verse in moments of respite from superheroic antics. From the get-go, there is no “off switch” where Peter is just Spider-Man. Everything that happens in the story is driven by the fact it has an impact on the duality of Peter’s experience: threats that appear as the story progresses don’t just affect Spider-Man’s day-to-day job of fighting crime, they ripple out and impact Peter’s work, and most crucially his relationships with key supporting characters like Aunt May, police chief Yuri Watanabe, and Mary Jane Watson (voiced here by Laura Bailey, who shares an electrifying chemistry with Lowenthal as MJ balances a tumultuous past with this version of Peter, and her own life as an investigative reporter at the Daily Bugle). Mary Jane Watson and Miles Morales form crucial support roles for Peter as the story unfolds. The most iconic and memorable Spider-Man stories, regardless of medium, play with that duality keenly, allowing the private and public personas of Peter Parker to collide in spectacular fashion. That is a premise wholly embraced here, as Peter finds himself going up against Martin Li (voiced by Stephen Oyoung)—the seemingly-benevolent philanthropist behind FEAST—who transforms into the shadowy comics villain Mr. Negative, creating a threat not just for Spider-Man, but also Peter and his loved ones. It’s a slow burn at first as the game establishes the current “normal” of Peter’s life, setting things up so it can then inevitably flip them upside down. But as the story begins to escalate further and further (and as a few more of Spider-Man’s most iconic villains start showing up), Spider-Man never loses sight of keeping Peter and his struggles as its focal point, rather than necessarily the struggles specific to Spider-Man. Few games can make the drama of whether or not your hero will be able to make rent on his tiny little New York apartment as palpable as the act of taking down the Kingpin of Crime himself, but that marriage of the ordinary and the extraordinary has been Spider-Man’s bread and butter for over half a century, and the Spider-Man game is full of similar contrasts. That dichotomy of Peter’s lives also comes into focus by how the game plays with what comics fans already expect from these characters, both friend and foe. By using an entirely new iteration of the Spider-verse, not beholden to any previous canon, Spider-Man is free to shake things up so that not only are your expectations for certain relationships routinely subverted as the plot progress, but you’re also repeatedly reminded that no one in Peter’s life is safe when the tension inevitably escalates. If you’re not a web-head immersed in nearly six decades of Spider-lore, it’s still a hell of a ride, jam-packed with moments of grand spectacle and all the epic action you’d expect out of the best superhero summer blockbusters. That said, Spider-Man rewards even an entry-level familiarity with the web-slinger with a constantly surprising tale, featuring moments and curve balls that will have fans talking for a good long while after they’ve finished playing. Yuri Lowenthal and Laura Bailey share a remarkable chemistry as Peter and MJ, with fantastic voice performances augmented by gorgeously animated cutscenes that really capture their tumultuous, intimate past. As a game, Spider-Man—arguably like many of its cinematic counterparts at Marvel Studios—plays with plenty of tried-and-tested concepts we’ve seen popularized by its predecessors in the genre, rather than necessarily advancing its own. Yes, it polishes those concepts to a sheen while presenting them through the lens of a beloved comics character but as slick and dazzling as it is, it is primarily an iteration and refinement of a great and familiar formula, rather than a true evolution in its own right. 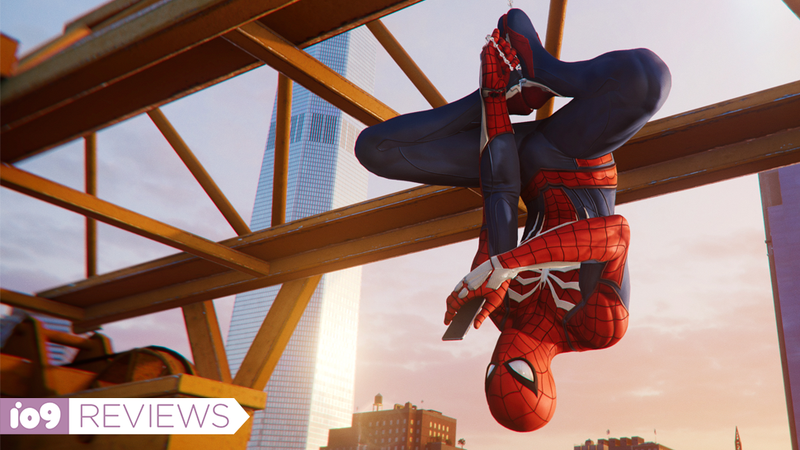 But while it doesn’t advance the world of action-adventure superhero games too far forward, the title represents a huge leap for the future of Spider-Man himself as a video game star. Beyond its excellent mechanical refinement and its earnest fondness for the legacy of one of Marvel’s mightiest heroes, the unique strength of Spider-Man lies in its unlikely star. Every great Spider-Man story is actually a great Peter Parker story first and foremost—and no game in Spidey’s long-swinging history within the medium has nailed that idea quite as remarkably as this one.